Choosing fishing sinkers depends largely on the location you are fishing at and what type of fishing you are doing. There is a wide array of different sinker types, sizes and shapes which you can choose from that will best fit your situation. Here are some different fishing situations and examples of fishing sinkers that should be used in that particular fishing situation. Bell shaped sinkers are one of the best options when trolling for fish in a boat. Their round shape makes it easy to get your bait down to the bottom quickly and their roundness prevents snagging by avoiding rocks and weeds. If weeds are a problem where you're fishing than an egg sinker or a bullet sinker would be a better option. Egg and bullet sinkers have a narrow edge to them and will do a better job at avoiding snags. Just remember to put bullet sinkers on the correct way. The thinner side should face the fishing rod. While fishing in rivers with fast currents a good sinker to use is a pyramid sinker. Their spike like diamond shape allows them to sink down quickly and they dig into a bottom if it's soft enough. Their shape also prevents them from rolling around in a fast moving current. In rivers that have lots of rocks and weeds in them an egg or a bullet sinker is a lot better option. Their round shape will help to prevent your line getting snagged between the rocks or weeds. Bell sinkers are an excellent option when fishing off of a shore. Their round profile makes them easy to cast especially when casting into the wind. In windy conditions bell sinkers will get you more distance than other shapes. Pyramid sinkers are also a good option especially when fishing in the surf. They drop quickly through water and dig in to keep your bait at the bottom. When fishing in a shore area with obstacles like weeds, rocks or fallen trees then something like a bullet or an egg sinker should be used to prevent your line from getting stuck. 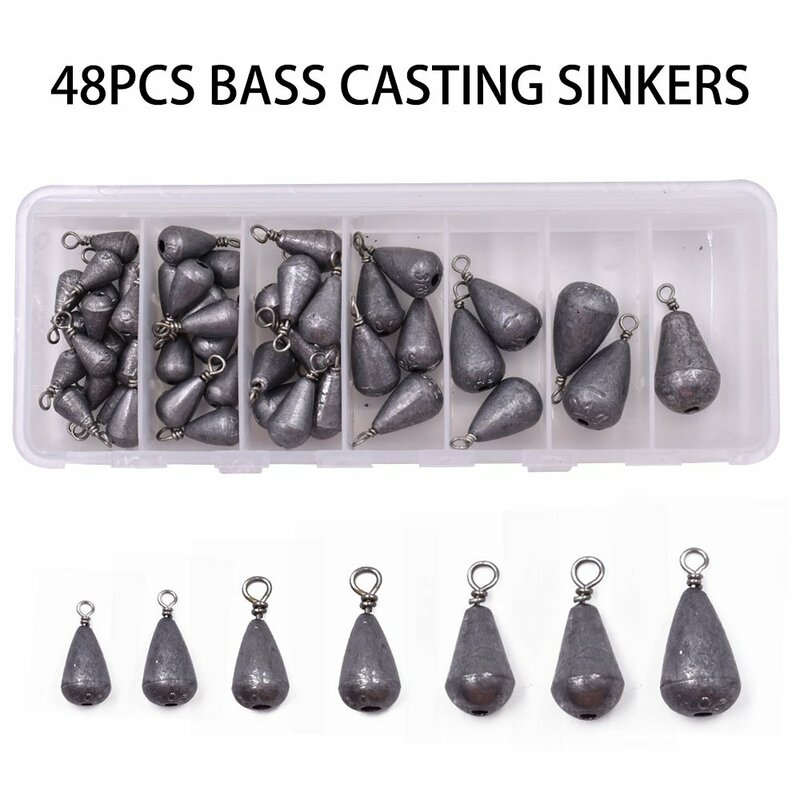 Split shot sinkers are one of the most common used sinkers for fishing. They have a split in the middle that allows them to be easily fastened to your fishing line. They can be used in for multiple fishing situations. Their main advantage is that they can be quickly attached to your line so their best used when you need to add some extra wait to your setup. These sinkers have a split in the middle and feature a rubber core. They get attached to your line by twisting the two rubber ends in opposite direction. Like split type sinkers they are quick and easy to attach, but they also are available in heavier options. Their oval like shape is also pretty good at avoiding snags. Again you can use them to quickly add weight to your rig. 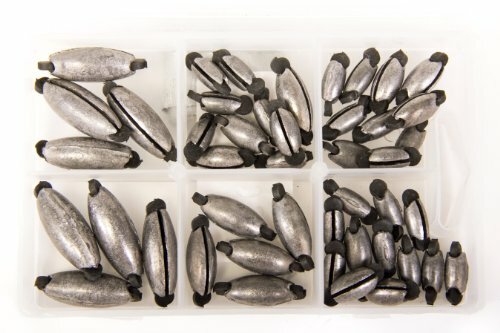 Assorted sizes bell shaped sinkers for sinking bait to strike zone. 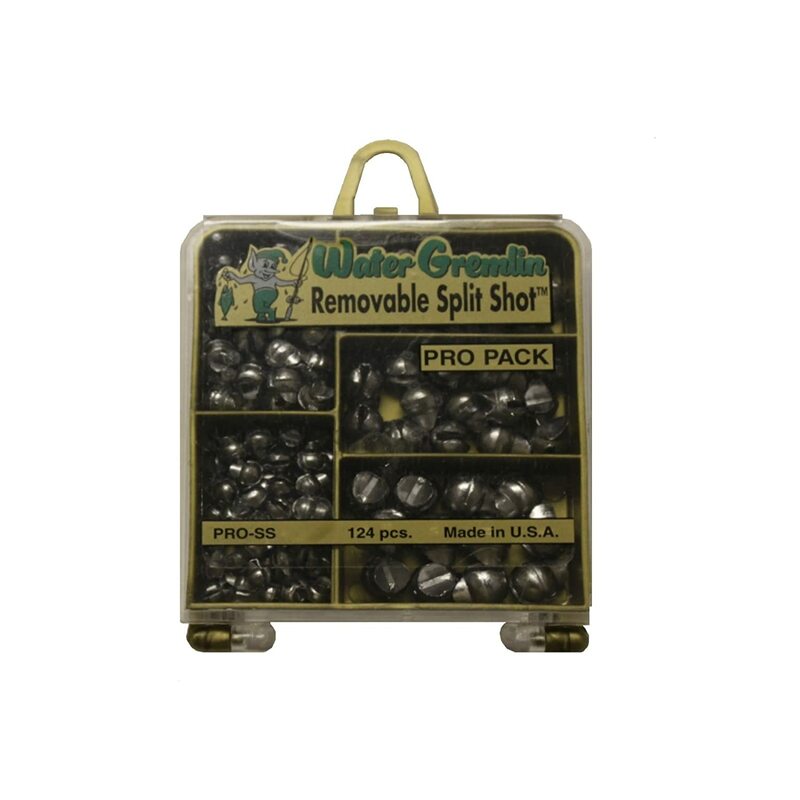 Assorted sizes split shot sinkers feature removable ears making changing sinkers quick and easy without tools. Assorted sizes rubber center sinkers make removing and adding weight quick and easy by twisting rubber center in opposite directions.